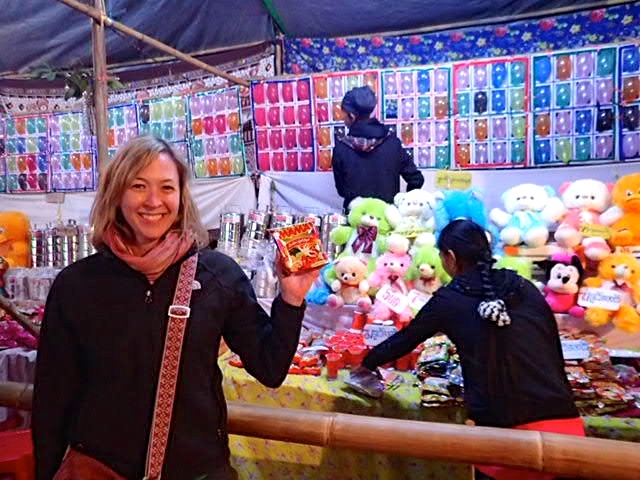 When I got back from Myanmar, everyone’s first question was ‘what was your favorite experience?’ And my answer was always the Ferris wheel ride. Lucky for us, the full moon festival had been pushed back a couple of weeks due to weather. It’s famous for its fire balloon competitions. Hot air fire balloons!!! As we drove up, I tried to convince my travel buddy of how exciting it would be to ride the rides at the festival. Carnival rides aren’t sketchy enough. Let’s ride them in a third world country!! A couple of German backpackers we met in Kalaw talked about a fun, hand-cranked Ferris wheel. What is that?!? And how could we not try it?? My friend told me how she was afraid of heights, and I admitted that the Ferris wheel was the only ride I was afraid of, traumatized as a little kid by people rocking the chair while at the top. 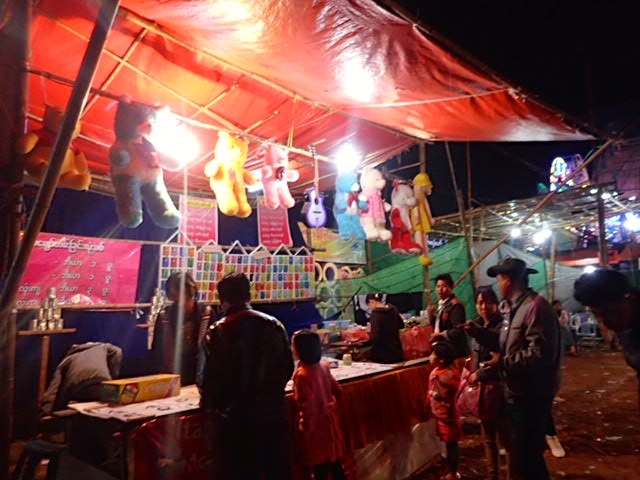 We walked through the festival, the only tourists in sight, and I was struck by the number of similarities with a county fair in the US. Rows of different food stands, familiar carnival games, rides with neon lights and loud pop music blasting, teenagers mulling around. Sure, the food and prizes were different, but it was remarkably familiar. After watching some locals play the darts/ balloon carnival game, I was feeling pretty confident. Five of my seven darts hit balloons, and I was rewarded with a prized package of Ramen noodles and cheers from the booth workers. All those drunken nights of playing darts during college had finally paid off! 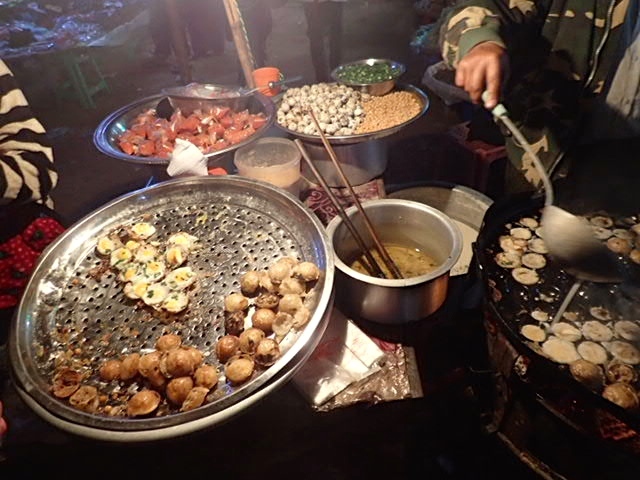 We took our chances eating roasted quail eggs from an adorable lady and her mother. Delicious! Seriously! We even went back for seconds. It was by far the least risky food choice at the fair. Across the path was an assortment of intestines hanging for all to see (and crave?!?). 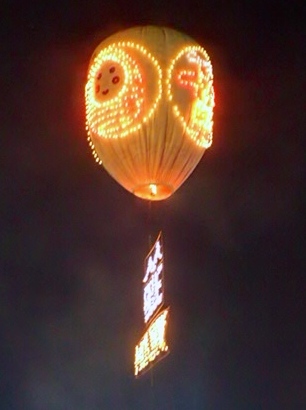 The main attraction of the festival was the hot air balloons. These unmanned hot air balloons are called fire balloons because the basket is loaded with fireworks, set on fire and then released as an offering. A fireworks display sailing over a crowd of people. 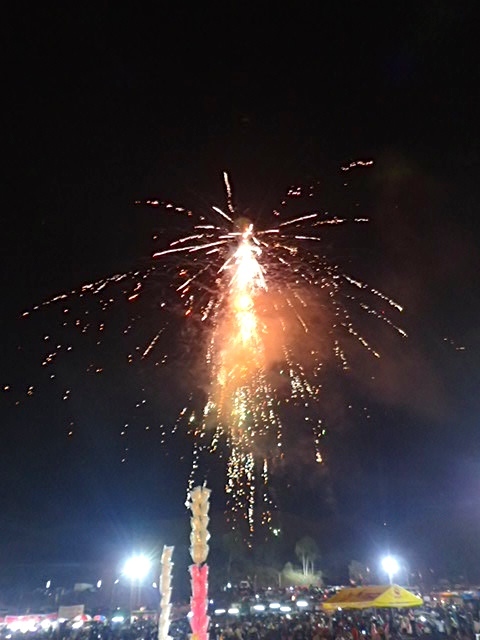 A few nights before, something went wrong, and the fireworks started going off too early, leaving the crowd below running from the falling flames. As they began setting the fire that night, we discussed a meeting point in case we needed to run. But we only witnessed beautiful fireworks lighting up the night sky, and flames falling on a crowd in the distance. The highlight for me was the rides though, a Ferris wheel and Buccaneer ride decked out with a huge image of Johnnie Depp from The Pirates of the Caribbean. 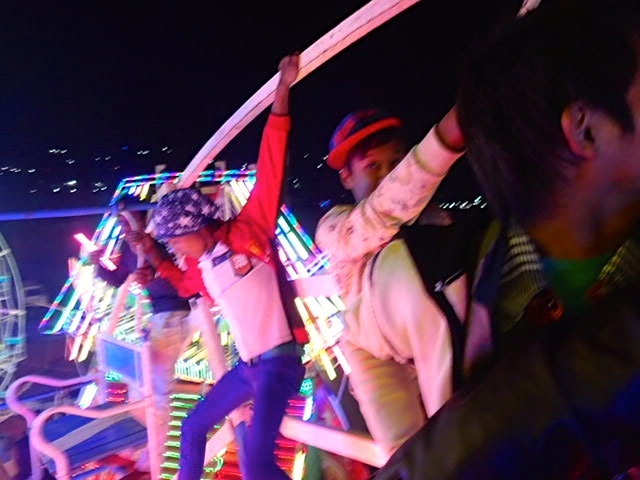 As we walked up to the Ferris wheel that we had heard so much about, they quickly sat us with two young Burmese men, and off we went. The teen boys running the ride gave us a menacing, knowing smile. They wheeled us around until we sat at top, taking in the lights, the views, the action below, as we waited for other seats to be filled. This was an old wooden Ferris wheel, with fewer safety features than normal. Not even a lap bar! Just a little elbow rest that you could awkwardly hold onto. The next 10 minutes were the most chaotic, terrifying and exhilarating 10 minutes of recent memory. I noticed that the old, wooden frame had started to shake. And then our chair started to rock. I looked over to see the teenage boys quickly scaling the Ferris wheel, laughing and headed straight for us. They climbed onto and around our chair. Bad childhood memories flashed back. We were screaming. Very loudly. Katharine yelled “Oh God, oh God, oh God. This is how people die!” I shouted, with a strange amount of authority, “STOP! NO!! What is going on?!? 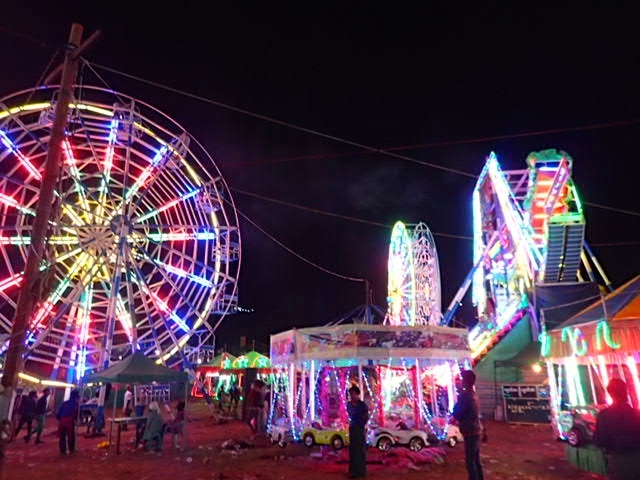 !” They began using their body weight to turn the Ferris wheel. Jumping and swinging from one bar to the next like monkeys. We started to pick up speed, and our terror turned to glee. Afterwards, we laughed so hard we cried. 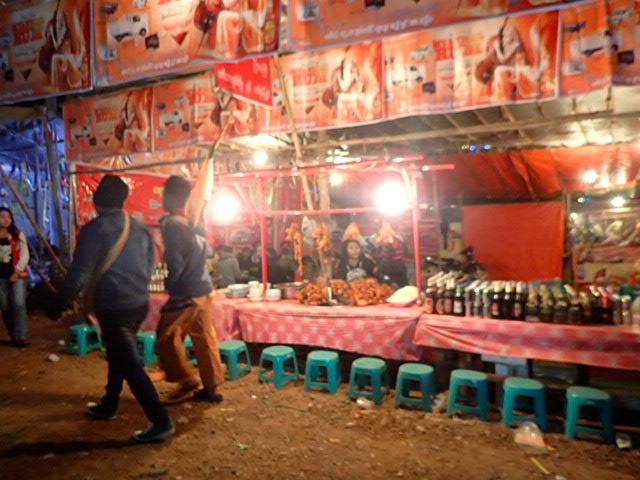 It was also the most local, authentic experience of the trip. Familiar and unfamiliar. Exciting and terrifying. It’s why I love to travel, and it’s why it was my favorite experience in Myanmar. But it also left us wondering what the heck a “hand cranked” Ferris wheel must mean in German. And we burst into laughter all over again.